Love is in the air during Winter ArtWalk, scheduled for Friday, February 1, 2019 from 5 – 9 p.m. in downtown Billings. Winter ArtWalk is the last of six events in ArtWalk’s 24th Season. 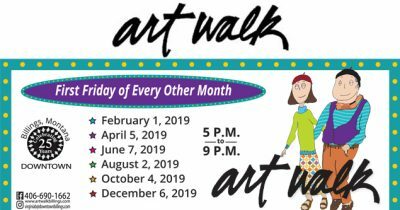 ArtWalk’s milestone 25th Anniversary Season begins with the next scheduled event on Friday, April 5, 2019. ArtWalk Downtown Billings is Montana’s largest ArtWalk. It features dozens of galleries, art studios, businesses, museums and other “art-worthy” locations in the city’s downtown core on an every other month basis. Locations feature original art and fine crafts. Many include gallery talks, artists in attendance, music and refreshments. In the last four years, ArtWalk has nearly doubled in size. It is one of downtown Billings’ most popular event. ArtWalk brings together artists, patrons, local and area residents, visitors, families and school groups who view art, participate in Billings ever-growing creative community and collect work from favorite artists who work in a wide variety of mediums. Many artists are known regionally and internationally. Maps, gallery notes, images and more information can be found on Facebook @billingsartwalk and www.artwalkbillings.com. Printed maps are at all participating sites the night of the event. On-street metered parking is free after 5 p.m.; parking garage rates vary. See you on the Winter ArtWalk and remember to share the love!